In a time not too long ago, a trip to Ladakh was something that could have been done only by your own vehicle. Other modes of transport back then were rare. These were the times when Leh Ladakh was termed as a biker’s paradise and the people who visited here were mostly either motorcycle enthusiasts or adventure junkies. Much has however changed in recent years. The tourism in Ladakh has evolved and the number of tourists in this once unknown part of our country has grown exponentially. And along with it, the availability of basic facilities too has largely improved. Now you can easily board a Bus for Ladakh and cover the entire region by public transport services. 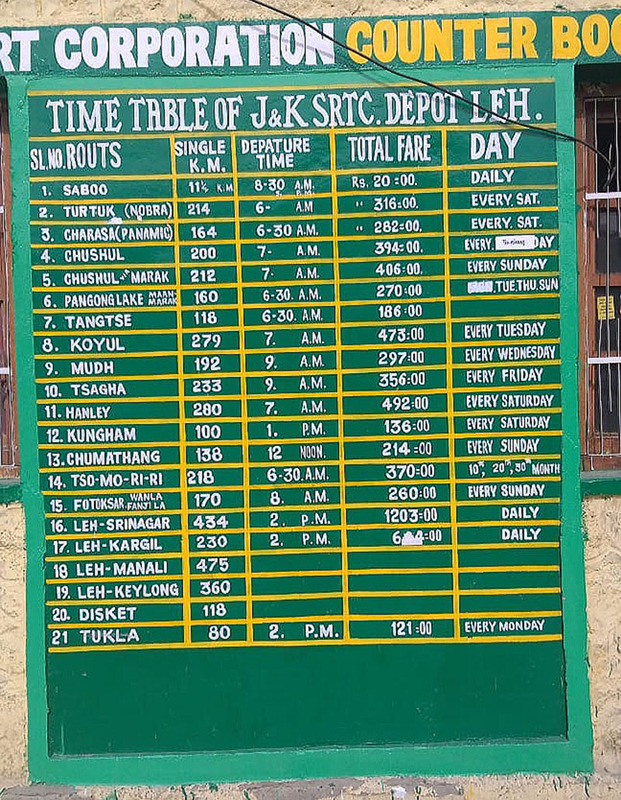 If you have been thinking about doing the same this year, then below is the latest Leh Ladakh Bus Service Schedule for the year 2019. The picture below was clicked at Leh Bus stand earlier this week by a friend. It shows timings, frequency, and fares of buses starting from Leh for different destinations within Ladakh. If you, however, wanted to read about how to get to Ladakh first, then I have covered this information in three other articles. Please read Manali to Leh Bus Service to read about how you can travel from Manali to Ladakh by public transport. Please read Srinagar to Leh Bus Service to know how you can complete the same journey from Srinagar side. If you would rather board a Bus from Delhi itself then you could do that too. Please read Delhi to Leh Bus Service to read how. For majority of the people visiting Ladakh, Nubra Valley, Pangong Tso and Tso Moriri are the biggest tourist attraction. So for the sake of understanding, let me break down the information in the board above in different categories so you can plan your trip better. For the majority of the people visiting Ladakh, Nubra Valley, Pangong Tso, and Tso Moriri are the biggest tourist attractions. Hence, for the sake of understanding, let me break down the information in the board above in different categories so you can plan your trip better. Saboo is a small village near Leh town located at about 11 kilometers away. There is a daily Bus to Saboo that leaves Leh at 8.30 AM. Fare per person is Rs. 20. There are a few hotels and luxury resorts in Saboo where a lot of people stay for the night. Listed below are buses that you can board from Leh for traveling to Nubra Valley. Turtuk is a small village in Nubra Valley which is also the newest addition in the list of places where tourists are allowed. It is actually the last village until where civilians are allowed. A Bus for Turtuk leaves Leh every Saturday at 6 AM. Fare per person is Rs. 316. This bus will pass through Khardung La, Khardung, Khalsar, Diskit, Hunder and Thoise. If you got down at Khalsar, you can use this Bus to travel to Panamik as well. Charasa is a small village in Nubra Valley near Panamik. The Bus to Charasa, in fact, passes through Panamik; and travels via Khardung La, Khardung, and Sumur before that. It leaves Leh every Saturday at 6.30 AM and fare per person is Rs. 282. If you got down at Khalsar, you can also use this bus to travel to Diskit and Hunder. The following buses can be used for traveling from Leh to Pangong Tso Lake. All these buses cross the high altitude pass of Chang La to reach Pangong Tso. A Bus from Leh leaves for Chushul every Wednesday at 7.00 AM. Fare per person is Rs. 394. Traveling by this Bus, you can get down at Spangmik to visit Pangong Lake as well. This bus travels via Erath. Another bus for Chushul is scheduled from Leh for every Sunday at 7 AM. This Bus travels via the villages of Man and Merak and fare per person is Rs. 406. There are three other buses scheduled for Pangong Tso from Leh Bus stand on every Tuesday, Thursday, and Sunday at 6.30 AM. These buses travel via Spangmik and Maan to arrive at Merak. Fare per person is Rs. 270. Traveling from Leh, Tangtse is located about 45 kilometers before Pangong Tso. A Bus for Tangtse starts from Leh every Tuesday, Thursday, and Sunday. Fare per person is Rs. 186. These are in fact the same buses that continue to Maan and Merak after Tangtse. A Bus from Leh leaves for Hanle every Saturday at 7 AM. This Bus travels via Spangmik, Erath, Chushul, and Nyoma. Fare per person is Rs. 492. Like Hanle, Koyul is another small village in Changthang Valley. A bus for Koyul leaves Leh Tuesday at 7 AM. This bus too takes the same route like the Hanle Bus until Nyoma. Mudh, also spelled as Mood, is a small village near Nyoma. A Bus is scheduled for this village every Wednesday at 9 AM from Leh. Fare per person is Rs. 297. Tsaga is a village after Chushul and before Nyoma; after the high altitude pass of Tsaga La. You can board a bus for here from Leh at 9 AM every Friday. Fare per person is Rs. 356. A bus for Tso Moriri leaves Leh on 10th, 20th, and 30th of every month at 6.30 AM. Fare per person is Rs. 370. A Bus leaves for Chumathang from Leh at 12 noon every Sunday. Fare per person is Rs. 214 per person. This bus travels through the towns of Karu and Upshi. Fotoksar, also spelled as Photoksar, is a small village from Leh at about 166 kilometers on Srinagar Leh Highway. A bus from Leh travels for this village every Sunday at 6 AM. Fare per person is Rs. 260. This bus travels on Srinagar Leh highway until Lamayuru and then reaches Fotoksar via Wanla and Phonji La. You can board this bus and get down at Nimmu, Magnetic Hill, Gurudwara Pathar Sahib as well and can even use it to reach villages like Alchi. A Bus leaves Leh every 2 PM every day and reaches Kargil by late evening. Fare per person is 604. A Bus for Srinagar leaves Leh every day at 2 PM and travels non-stop to reach Srinagar the next morning. Fare per person is Rs. 1203. This is actually the same bus that first reaches Kargil and then continues to Srinagar. There are actually three different types of Buses available for traveling from Leh to Manali. Please read Leh to Manali Bus Service for a detailed description of this service. The same buses travels to Keylong as well and then continues to Manali via Rohtang. I hope the information above on Leh Ladakh Bus Service was of help. If you have any questions, or need any further information, please feel free to ask in the comments section below, or at our Community Forum; and I will be glad to answer. can i get a taxi that will leave srinagar at 6AM and reach leh same day evening. halt at leh 2 days. again leave leh 6AM and reach srinagar at evening. then two days local at srinagar. Talk to Faisal @ 9596410670. Should we need inner-line permit to travel in bus to Pangong and Nubra valley ? ?